← It’s Tuesday And Time To Un-Lax! Need To Get Out! Movie Time! We rested until we could not rest any more so we called Jan and Brian and suggested we go see “The Darkest Hour”. We first stopped by Old Ranch to drop of the latest plans for New Years Eve and then headed to South Coast Plaza to have a drink and appetizer at Season’s 52. After Seasons, we headed to the movie theater which was two blocks away! Summary: A thrilling and inspiring true story begins at the precipice of World War II as, within days of becoming Prime Minister of Great Britain, Winston Churchill (Academy Award nominee Gary Oldman) must face one of his most turbulent and defining trials: exploring a negotiated peace treaty with Nazi Germany, or standing firm to fight for the ideals, liberty and freedom of a nation. 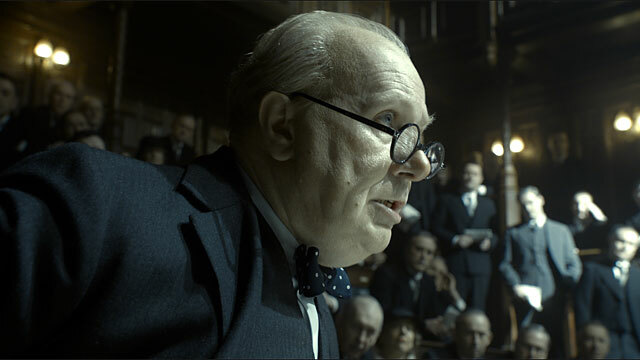 As the unstoppable Nazi forces roll across Western Europe and the threat of invasion is imminent, and with an unprepared public, a skeptical King, and his own party plotting against him, Churchill must withstand his darkest hour, rally a nation, and attempt to change the course of world history. It reminded Paul of President Trump having to do battle with powerful weaklings! Stay the course Mr. President, we are behind you! We headed home about 9:15 PM and watched some TV before crashing for the night! This entry was posted in Food and Wine, Friends and tagged Friends, Old Ranch, Theater. Bookmark the permalink.